The Duplication and Printing of CD's and DVD's can be a very profitable business. Discspeed have all the equipment that you will need to get your duplication business off the ground. CD Duplication time = 3mins per CD, thus 11x CD's every 3mins. *The DVD Writers in the V12 will burn CD’s at 56X, DVD’s at 24X, and Blu-Ray at 8X. This of course is only possible if your media can keep up with the Speed of the V12 !! 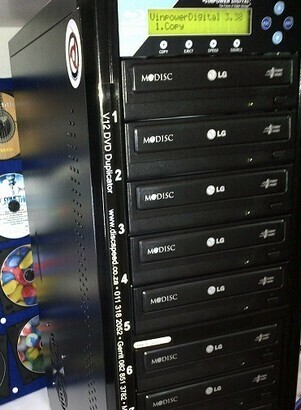 *DiscSpeed V12 Duplicators run on high-octane Hard Drives of 7200RPM, and with a capacity of 500GB, you can store 460 CD Images, 93 DVD Images, 57 DVD-DL Images and 19 Blu-Ray images. *We build the V12 Duplicator with the latest iHAS124 DVD Writers. *We get the best Media Compatibility with these writers and the reliabilty is excellent. *The Controller we use is a Vinpower CD - DVD - Blu-Ray controller, that supports Copy Protection. *The Case has a 400W PSU to drive the 12 DVD writers, and 4x High Power fans to ensure proper cooling of the V12's DVD Writers. In order to ensure that you suffer no loss of discs in the event of a power failure, we recommend the use of a 1000VA UPs, as this will give you sufficient time to complete the current duplication job, in case of a power failure. Vinpower Copy Connect is installed on all systems. DVD Video Copy Protection option is built-in, and activated when purchasing the relevant licences. The system comes as standard with the "Copy Protection " feature and the relevant software, However to use the Copy Protection feature, one has to purchase licenses. With each license, you can create "1x Copy Protected Master" with the supplied software on your PC, after which the copy protected master image is sent from the PC to the Duplicator via USB-3. The V12 system can now make copies of the Copy Protected Master, and all these copies will be "Copy Protected". Thus, with one license, you can create 1000's of copy protected copies. Very import is that the copy protection, is appliccable only to DVD Video .VOB files.!! 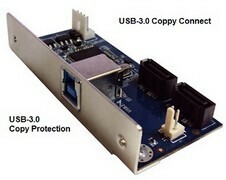 * This USB 3.0 card connects to your duplicator's writer drive(s) through the controller to allow the drive(s) to be connected to a PC as an external writer. * This device can also be used with the Vinpower Copy Protection feature if used in conjunction with a copy protection compatible controller. The most important component in a duplicator is the controller. Our controller (the duplicator's motherboard) is specially programmed to offer the highest quality performance of any controller on the market. The quality of the controller can make all the difference between making perfect CD and DVD copies or ending up with failed or low quality copies. In fact, if you took two identical duplicators with the only variables being the controllers, our VinPower controller will produce a better PIPO number every time (scale for measuring DVD disc quality). •Complete Standalone Operation: No PC required to operate the duplicator. •USB Copy Connect (optional): Able to transfer image files directly from a PC to the duplicator's internal HDD. No longer need to burn a master disc to initiate the duplication process. •Continuous Hard Drive Partitioning* : The HDD partitions are created without limitations using the same amount of space as the actual content size on the disc. No longer do you have to worry about loosing valuable HDD capacity because your duplicator allocates the exact space required without wasting space like standard partitions on other controllers. •Multi-format duplication: Able to duplicate Blu-ray**, HD DVD**, DVD, CD and upgradeable for future drive and media applications. •Industry leading 256MB buffer memory *: Keeps all drives burning without pausing (known as buffer underrun) for the most stable and reliable high speed duplication - The higher the memory buffer the less likely to encounter buffer underrun errors. •Creates mix compilation CD+G Disc **: Able to compile multiple CD+G tracks onto a single disc from multiple sources. •Supports all common CD Formats with Additional Special format including CD-TEXT, ISRC, Over-Burned CD. •Drive firmware upgradeability: Capable of upgrading the drives for selected brands through the Duplicator. **Ability to copy Blu-ray, HD DVD, and CD+G format depends on whether the writer drive supports those formats. •AutoCopy feature: Fast duplication without pressing any buttons. •Account management (password protection): This function will authorize only specific user(s) to operate the duplicator with their preferred settings. Able to assign numerous passwords for multiple users. •Auto-Counter Technology: Displays the total number of discs successfully copied compared to desired output for each project. •Hard Drive Partition/Image Name Editing: Simply stated you can name the images stored on the hard drive partitions. •User friendly interface with 'easy-to-read' LCD display: Offers easy to recognize and use terms and operations on the LCD display for simple usage. •Fast Key Support: 4 fast keys for faster operations. •Power on Self diagnostics: Keeps the duplicator functioning optimally. •Disc Info feature: Provides the format of the disc & the disc manufacturer's information. •Selectable Disc burning speeds: Ability to increase or decrease duplication speed for supported formats. •Creates mix compilation audio CD: Able to compile multiple tracks onto a single disc from multiple sources. •Supports all currently available DVD media including Double/Dual layer DVD9: Can duplicate Single Layer DVD±R/RW and Double/Dual Layer DVD±R Formats. •Auto DVD Format Conversion: Can convert media between DVD+R/RW and DVD-R/RW automatically. •Automatic format recognition: Duplicator recognizes automatically if the discs are CD or DVD as well as the correct format to copy. •Upgradeable for future drive technology: Able to upgrade duplicator for installation of future drives. •Future functions upgradeable through firmware: Duplicator able to upgrade future software updates via Firmware. •Continuous copying without waiting for cool down: No need to stop the duplicator for fear of overheating. Format supported depends on the writer drive used.